For the first time ever in the UK a nut and bolt restoration of a classic car is to be undertaken by apprentices who are serving their time at a Shropshire company. 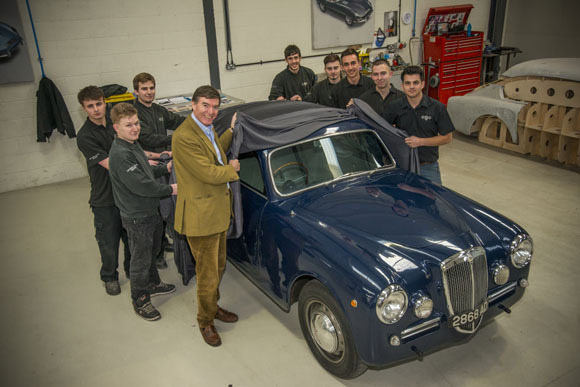 MP for Ludlow and Minister of State for Defence Procurement Philip Dunne has unveiled the first car ever to be fully restored by apprentices in the UK. The eight apprentices are all employed by Classic Motor Cars Ltd (CMC), a premier restoration company based in Bridgnorth, and will be given the chance to re-build a 1955 Series 4 Lancia Aurelia and learn the complete restoration process. They will strip the Lancia Aurelia and then assess what needs to be replaced, restored or remade. They have been given 14 months to complete the restoration of the car. Mr Dunne said: “It is great news that Shropshire apprentices will become the first in the UK to undertake a complete restoration of a classic car. He added: “More than 3,000 apprenticeships have been started in the Ludlow Constituency since 2010, and I hope we will see this figure continue to rise as more young people and employers gain mutual benefits. The eight apprentices are Dan Conway (23) from Bridgnorth, who is learning his trade in the body shop and leading the team; Sam Gould (23) also from Bridgnorth and Luke Adams (22) from Wolverhampton, both in the trim department; Jack Brettle (19), who is a mechanical technician from Kingswinford; Charlie Jessop (23) from Dudley in the paint shop; mechanical technician Marcus Nemeth (20) from Wolverhampton; electrical apprentice Tom Smallman (24); and engine builder Ben Taylor (22), both from Bridgnorth. After unveiling the car Philip Dunne talked to apprentices about the work that they will undertake on the car, which is owned by CMC’s Non Executive Director David Barzilay, from re-making body panels, rebuilding the engine, re-wiring, re-painting and re-trimming. Peter Neumark, Chairman of CMC, said: “Apprentices are extremely important in the world of classic cars, which is worth several billions to the UK economy every year. It is essential that they learn the skills to keep classic vehicles on the road. We are proud of the fact that currently we have more than one apprentice for every ten members of our workforce.